With the rise of digital processing systems (PC, DSP, microcontrollers, FPGAs) software demodulation of radio signals is now the method of choice for best performance both in terms of sensitivity and implementation cost. However, the fact of demodulating in a purely software manner the signals causes radically different architectures of those traditionally used in analog demodulation structures (Costa loop, PLL, etc.). Provide participants with an overview on the most used software radio techniques (SDR), for final implementations on microcontrollers, DSP, FPGA, or even PC. The methods will be practiced via exercises with Scilab (free equivalent of Matlab). Place: Toulouse (France), dates : contact us. In this first part, we will first try to have an overview of the components necessary to perform a demodulation system, then we will study pre-processing techniques in order to extract requested radio channels from a 'wideband' input. Introduction: Description of a typical radio channel demodulation chain and presentation of the different components required. Conversion to baseband: Notion of I/Q signal. Conventional method (downconversion and suppression of the image) and Hilbert filter method. DDS (realization of digital oscillators): description and advantages / disadvantages of the main techniques: LUT, CORDIC, harmonic oscillator. Implementation in a local oscillator. Implementation in a PLL. Channel filtering: filter synthesis techniques with Scilab tool. Multi-rate filtering and polyphase filters. CIC filters for systems heavily over-sampled. In this section, we will first do a roundup of various classic digital modulations (waveforms), then we will discuss various techniques for baseband demodulation. Formating symbols: Problematic of inter-symboles interferences (ISI), notion of matched filters, NRZ filters, gaussian filters, RC / SRRC filters. Low complexity demodulation techniques: incoherent demodulation of phase / frequency modulations (polar discriminations, ...). Carrier recovery techniques: initial locking (FFT), tracking techniques (PLL / second order loop), possibles detectors (based or not on symbol decision). 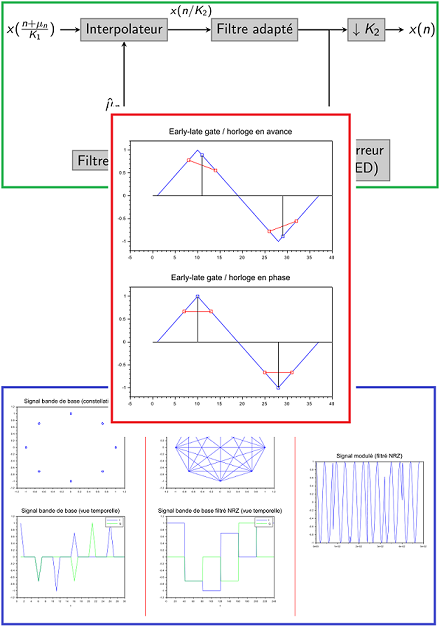 Clock recovery techniques: architecture of correction loops (PLL), timing error detectors (early late gate, Gardner, Mueller \& Muller), interpolators (cardinal splines, Farrow). In this section, we will see how to qualify a demodulation chain, in a purely software manner , and taking into account the problems encountered in reality. 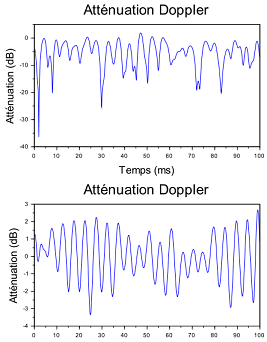 Dispersive channels: effects of multipath and Doppler. Rayleigh and Rice models. Other important perturbations (clock noise, phase noise, doppler shift), speed of PLL locking, sensitivity to adjacent channels, blocking, etc. 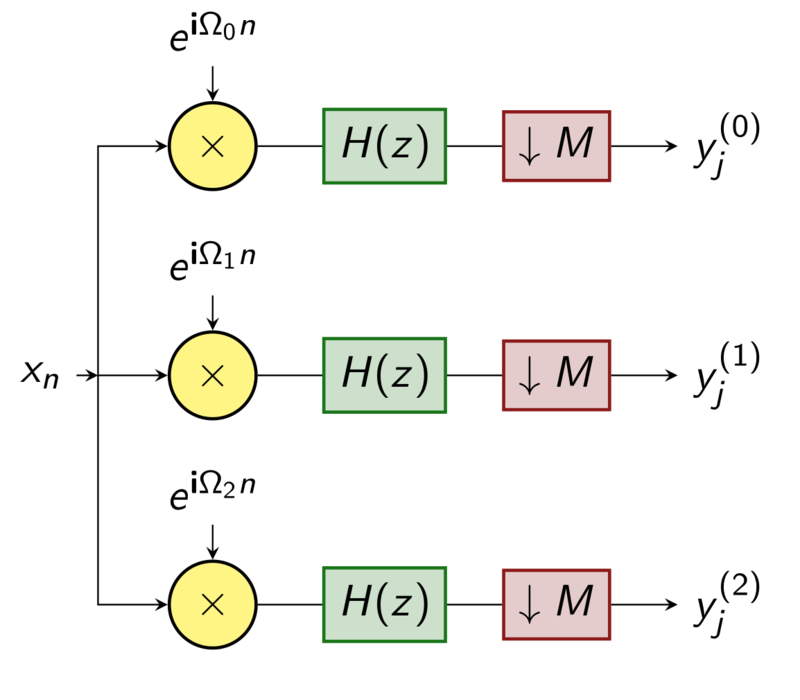 We will see also how to compute the LLR (Log-Likelyhood Ratios) at the output of a demodulator so as to implement soft decoding to gain in sensibility.